Aiding in the ever-necessary calibration of where our leaders—and thus the nation—stand on morality, it seems Donald Trump now ranks somewhere behind pharmaceutical companies and just ahead of Furniture Feet, having thrown his endorsement behind Fox News host Bill O’Reilly just as more than 25 advertisers have rescinded theirs. Mercedes-Benz, BMW, Lexus, Allstate, and Bayer are just a few of the many big names who pulled their ads from The O’Reilly Factor this week, in the wake of a bombshell New York Times investigation that revealed O’Reilly and Fox had paid five different women some $13 million in settlements for sexual harassment and abuse claims. However, while these corporations were shocked to learn of sexual harassment at the company whose CEO had been ousted over sexual harassment, perpetrated by a host who’d repeatedly defended that CEO—while also being accused of sexual harassment for over a decade—and all taking place against the backdrop of a toxic, petty corporate culture that resembles Mad Men if they ate the cigarettes and where Megyn Kelly somehow qualifies as a feminist hero, it’s nothing compared to Trump’s surprise that this is even such a big deal. It was similar to the defense Trump made of Roger Ailes last summer amid Ailes’ own growing allegations of serial sexual harassment, where he called the man who turned modern politics into all the worst parts of sports fandom and arguing with your grandpa combined “a very, very good person.” In Trump’s testimony for O’Reilly, the guy whose only friends are his terrified children once again offered himself as a character witness—but notably, there’s also some room for semantic interpretation there. 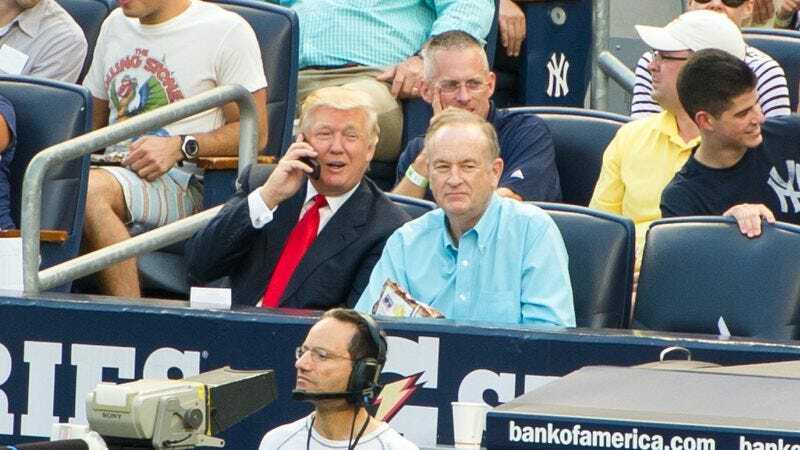 You could argue that Trump is saying he believes O’Reilly did not commit the sexual harassment of which he has been accused and, occasionally, recorded proposing doing with a falafel. Or you could argue that Trump believes that, if O’Reilly did harass those women, there was nothing wrong with it—that it was simply locker room talk, or that, because O’Reilly is a celebrity, it was even welcomed. Your interpretation depends on whether you believe Trump is the decent, upstanding gentleman who vehemently denied his own sexual abuse allegations by threatening to sue his accusers, or the bawdy, down-to-earth guy’s guy who knows that hey, grossly unwanted sexual advances are just part of the go-go 1980s world we’re all living in—c’mon toots, lighten up. Bright lights, big cities, occasional molestation and so on. Either way, as Trump has long maintained, you should never settle. Unless it’s some meaningless little hundreds of lawsuits over slave labor, racial discrimination, intimidation, fraud, or sexual harassment. Trump’s defense of Bill O’Reilly comes five days after he declared April as National Sexual Assault Awareness Month, which so far appears entirely predicated on providing examples.